Travel Nurses Day celebrates and honors hardworking Travel Nurses nationwide. 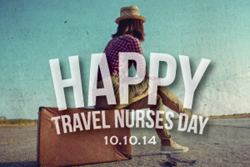 Medical Solutions Celebrates Travel Nurses Day 2014! Creating Travel Nurses Day — a day dedicated just to them — is a really meaningful way for us to recognize and thank them for everything they do. Medical Solutions, the nation’s third-largest Travel Nurse staffing company, will celebrate the second annual Travel Nurses Day, this Friday, October 10, 2014.